Moving time: 5 hr 53 min. I slept in a little today and didn't hit the road until 9:00am. It really killed me since the day got very hot very fast and I had a long ride to do. The mountains are unrelenting herevery steep going up and down. I had to push my bike up some mountains again today. 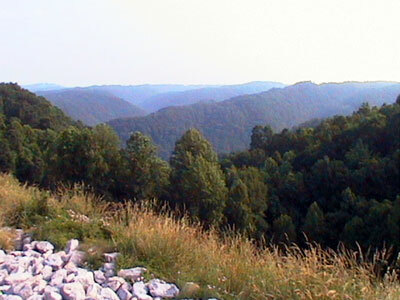 I'm only one more day from Berea, KY where the mountains are supposed to end! One thing about Kentucky - they put rumble strips on the shoulders of every road. One road I was on, SR 80, is a four lane divided highway with a shoulder about as wide as a lane but I couldn't ride it because of the deep rumble strips. Limestone and coal are also scattered all over the shoulder from the trucks and I finished the day covered in coal dust from the dozens of coal trucks that passed me. The other thing that is disappointing is the lack of route signs. I was spoiled in Virginia by having the reassurance of going the right way by following the "76" route signs but there are none to be seen in Kentucky. Perhaps it is up to each state to post them. Here's a funny thing. There are elections for local offices like magistrate, jailer and coroner going on right now here in Kentucky. The campaign signs are absolutely hilarious. All the candidates have at least four names like Billy Jim Joe Bob Worth. Most all of them list their nickname on the sign ("Junior," "Bubby," "Moe," and "K.T." are some examples). One guy's real name is Clenis. I actually saw a campaign sign for a guy with the nickname "Booger" running for jailer. Scary. A bunch of them are pictured posing with their horse or truck on the poster. A hat of some sort is requisitesome go for the cowboy look. Others are dapper in their CAT, Skoal or John Deere hat. People here speak a whole 'nother language. I feel like I'm in a foreign country. When I stopped to ask directions to the Presbyterian Church shelter in Booneville, the guy at the gas station was completely indecipherable. At least he pointed. I went that way and found someone else. Same deal. Don't they watch the evening news? They could learn a lot about the English language from Dan Rather. I know they have television here because every doublewide has an antenna on the roof. Many school are sites for family assistance centers and it seems there is some kind of summer school that a lot of kids are attending or school is just not over yet since buses run all day with kids on them. By the way, my Achilles tendon is doing much better. The medication did its trick. I have two more days of the steroidal medicine and then I'm on to the high dosage Ibuprofen. The Prednisone has an excellent side effect - it increases appetite. I had problems with my appetite but now I eat like a hog when I get the chance. I don't have to force food down anymore. People smoke and drink a lot around here. They smoke inside without giving it a second thought and I have seen more beer leave convenience stores than you could imagine. People drink and drive too. I suppose that's the reason for the rumble strips. The log book here at the church shelter shows that Teresa and Hugh were here on the 8th. That's 12 days ago and I passed them on the 14th so I'm making very fast time. I met them two days before I stayed in Radford and they were heading eastbound. They are among the first, if not the first, to make it to the Atlantic. 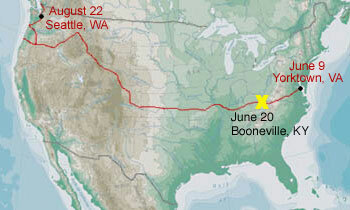 They started in March and followed the Western Express Route from San Luis Obispo, CA to Pueblo, CO where they picked up the TransAm. 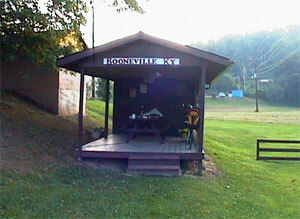 Here's a picture of the Booneville Presbyterian Church bike shelter.